Program StringGridDemo displays an array of records in a string grid. When you edit, add and delete records the procedures change the underlying array accordingly. You save the records to a file and open the file the next time you use the program. The first time that you run the program, if you do not have a data file, the program will create one from a hard-coded array. 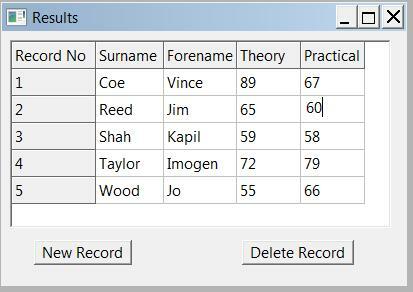 If you click on the heading of the Forename or Surname column you sort the records based on the data in that column. You could write procedures that sort the records based on the data in the Theory and Practical columns. (The inbuilt sort procedure works for strings). We describe ways of validating the text entered into a string grid in the next section.